In our latest contingency plan regarding the Bitcoin Gold (BTG) hard-fork, which was released on this blog a few days before the initial forking point (October 24th), we had spotlighted the intentions of the Bitcoin Gold team and how Crypto-Games was going to prepare for this situation and planning to handle it. As there have been a few unexpected delays since the release of that initial blogpost, here’s an updated version with information about the events that happened since and with final deadlines, as well as a short explanation on how to claim your Bitcoin Gold from Crypto-Games. Bitcoin Gold forked as expected off the Bitcoin chain at block 419407 (mined on late October 23rd / early October 24th). However, since the replay protection for Bitcoin Gold transactions wasn’t finished at this point, and the address version wasn’t changed either, the actual launch of their network couldn’t happen yet. After several testnet versions in the first two weeks of November, the mainnet for Bitcoin Gold launched on November 12th at 19UTC. The first few hours were locked for mining and transactions, as the developers carried out their premine. In the early hours of November 13th the public launch of the network happened, mining started for everyone and transactions were being processed. In order to claim your BTG you simply have to submit a valid BTG address to Crypto-Games. To do so, visit the site, log into your account and select the following options: “Your account” -> “Settings” -> “BTG Address”. In the now opened popup you’ll find a section to enter your address and a button to confirm the submission. Please note that BTG uses a different address format than BTC and BTG addresses look different as a result. A proper BTG address starts with either G or A (as opposed to Bitcoin addresses starting with 1 or 3). Please don’t try claiming BTG to BTC addresses. Enter your valid BTG address in the section that reads “BTG (Bitcoin Gold) address:” and press the button that says “Save BTG address”. Afterwards, please double-check the address was indeed saved and is correct. At this point, your part of the claim is completed, everything else is handled by Crypto-Games. The transaction with your coins will be sent shortly afterwards (a few hours up to a few days, depending how many submissions we get) and your BTG will arrive at the destination you provided. Crypto-Games is accepting addresses for the BTG distribution starting right now. If you already have set up a BTG wallet or your preferred exchange already accepts BTG deposits, simply copy your address and enter it on Crypto-Games via the interface. The actual distributions (=> sending out of transactions) will start a short while after the release of this blogpost. Distributions will be handled based on submission dates, meaning those that submit an address early will receive their transactions before those that submit an address late. The interface for entering BTG addresses will be available until December 4th 18UTC, at which point the period for claiming BTG ends. Please make sure you’ve submitted a BTG address before this date, or you will lose your claim and won’t be able to receive your BTG. This deadline is fixed and non-negotiable. Do not miss it. Currently confirmed available wallets (as of bitcoingold.org): Coinomi (https://coinomi.com), Guarda (https://guarda.co/), Freewallet (https://freewallet.org/), MyBTGWallet (https://mybtgwallet.com/), BTGWallet.onilne (https://btgwallet.online/). 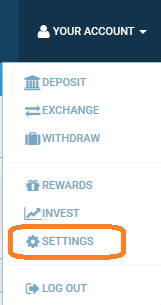 Currently confirmed available exchanges (selection, same source as above): Bitfinex (https://www.bitfinex.com/), HitBTC (https://hitbtc.com/), OKEX (https://www.okex.com/), CEX (https://cex.io/). As always, questions can be directed at our staff in the chatroom, asked on our bitcointalk thread, or via a quick email to our support staff, all of which will help you to the best of their knowledge with problems that might occur during the process or further questions you might have about either BTG or how Crypto-Games handles the distribution.